Quota attainment is an incredibly powerful diagnostic tool when understanding your SaaS startup’s go-to-market health. Quota attainment measures both the success of individual account executives and the performance of the team. To achieve best-in-class quota attainment, a startup must execute the go-to-market strategy well across five dimensions. 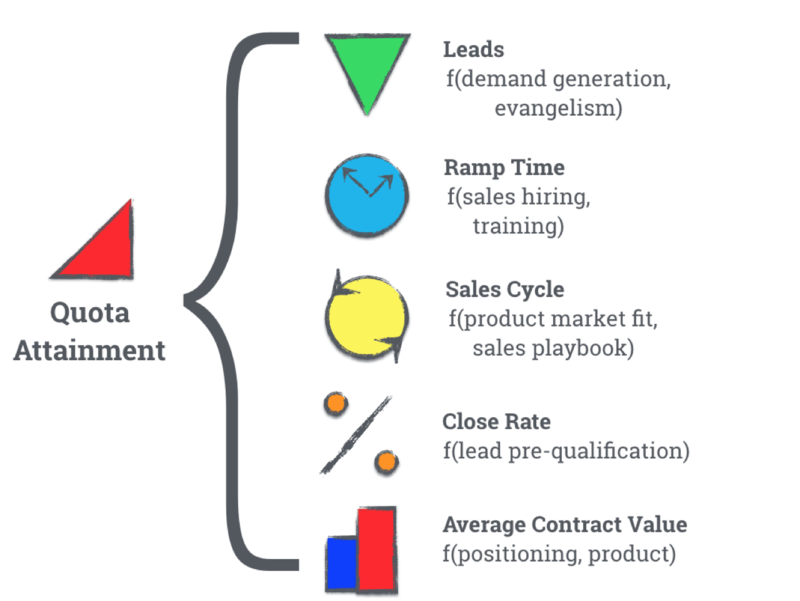 First, the startup must supply the sales team with a growing volume of high quality leads. SaaS companies generate leads in many ways including through sales development reps, search engine marketing, paid social, lead capture on the home page, events, customer referrals, evangelists and channel partners. Consistently growing qualified leads is essential to quota attainment. Second, the startup must ramp sales people quickly. As SaaS companies scale, most companies begin to hire aggressively in sales. In the early days, a SaaS startup might have one or two sales people. Then they begin to hire one per quarter, then one per month. Pretty quickly the company is hiring 12 to 16 reps per quarter. Sales hiring process and sales training become essential tools for success when hiring this many people to ensure each account executive’s success. New account executives must be trained, learn the business, understand the sales motions, acquire techniques to handle customer objections, and absorb the parlance of the industry and company. In addition, fast ramp up periods imply sales people begin to book business earlier, which reduces the company’s burn. Imagine a hypothetical SaaS company hiring 8 AEs per quarter. If the account executives aren’t trained well, and they require 9 months to become productive (ie, book business), then the company is paying 24 account executives salary, none of whom are generating revenue. Fast ramp cycles also help sales managers understand which account executives are a good fit, and which aren’t. Third, quota attainment relies on efficient sales cycles. Setting aside industry specific considerations, longer sales cycles indicate a lack of product market fit and/or an immature sales playbook. Longer sales cycles indicate the sales team is challenged to generate immediacy in the sales process. In contrast, short sales cycles carry many advantages including faster improvement of the sales playbook, more efficient growth of the company, and simpler financial planning. Fourth, close rate, the percentage of qualified leads that ultimately convert into customers, is a lagging indicator of the SDR team’s effectiveness, and whether leads are being properly qualified before filling a sales person’s hopper. Last, the average contract value of a customer reflects the strengths of a company’s positioning in the market and the quality of the product. Bill Macaitis would say the delta of the company’s NPS vs its competition. Quota attainment success is a composite go-to-market metric that when decomposed reveals where a SaaS startup’s go-to-market strategy is strong and where it needs work.